OKay, lamp colours issue was much as expected : skin and brightmap being coloured red. The following file uses your DECORATE and DOOMDEFS (albeit cut down so only the goth lamps are present). I didn't tweak the light colours at all but now that things are working, perhaps the blue could be a tiny, tiny bit more cyan-like (increase the green value slightly - curently 0 ) to make it appear a bit brighter (or maybe it's fine as-is) and perhaps use attenuation as already discussed. I have included new skins. The blue and white lamps now have their own skins and because there is now a red and blue option, I made the red one slightly redder too. The brightmap has been greyscaled so that it suits all of the skins. I also included "off" versions of all skins. You may want to use them or you may decide that the off versions look better using the grey skin (although the veiny part over the globe still has a reddish hint to it). My only concern is that switching a lamp between one of the coloured versions and a grey "off" state might look a bit stark. With a bit of additional work, it would be possible to create coloured "on" versions that are grey where the light logically wouldn't hit them. As ever, let me know if you need any changes. As I said, the following file contains the modified Goth lamps but all other entries have been trimmed out (the map has been updated to have the modified lamps too). As before, all skins are compatible with all models so just mix and match as you see fit in modeldefs. Perhaps the property is built into the model. 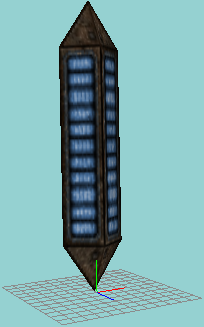 No matter; when I place it into the map editor I'll assign it the proper height. I brought this up as a curiosity. It all looks splendid now. Thanks. Glad it's what you wanted. On the lamp position thing, the origin of the Gene-Tech model is right in the middle whereas the other lamp has the origin underneath it. Neither is particularly wrong nor right, merely the way they are. 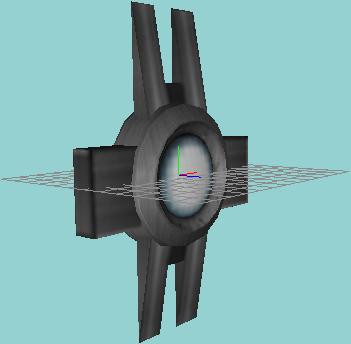 Having the origin below the actor (like the Xen lamps) probably makes more sense in Doom given that Doom item heights start at the bottom but in an actor like this, it really doesn't matter. I can alter it if needs be but, as you said, all you need to do is set the Z coordinate appropriately in WADAuthor (I assume that's still your editor of choice). If you really wanted it shifted up, another (perhaps easier) option would be to use ZOffset in your MODELDEF. (You could try something like "ZOffset 24" for starters and adjust to suit (I'm not sure of the exact size of the model)). ZOffset can be used to shift the model's appearance up/down in game without actually having to edit the model file itself. Thanks for the explanation. No need to made any modifications, as what the game needs can easily be adjusted by editing the actot’s properties in the editor or via the MODELDEF. On a somewhat unrelated note, I read the ZDooM wiki on light attenuation but can’t figure out how to incorporate that feature into a pointlight definition for our lamps. It seems like the wiki is talking about how to define something new. Am I missing something? As I mentioned before, you might want to increase the size slightly as attenuated lights tend to not look quite so bright. However, I just tried the above and it looked reasonable without any further tweaking. Ah, okay. I understand now. Thanks. Some articles certainly can be a bit brief/confusing/unclear/incomplete/inaccurate but I feel that the vast majority are good enough to provide the help needed when I'm looking things up (and some are very good). It's worth remembering that the articles are created by a pretty varied group of people with varying skills in English (regardless of whether they are native speakers or not) and varying experience with writing documentation. When it comes down to it, a lot of work has been put in and it's actually a pretty vast and approaching fully comprehensive document for the game's features. It's certainly a lot better than no documentation and it takes the pressure off the developers to write documentation. The option always exists for anyone to edit and improve articles if they see a need and have the necessary skills and time to do so (or, if not, report problems on the Wiki thread over at ZDoom and ask for/suggest improvements). I haven't done much editing of it because, most of the time, the articles I look at are OK for what I need and I find the Wiki editing format a bit clumsy too, but I have made a few minor tweaks over the years. I guess the biggest common "complaint" that I have is lack of examples in some of the articles but I rarely add any because the reason I'm looking is that I need examples and don't have one of my own. Agreed, that the ZDooM wiki is an excellent, and widely-encompassing resource. I wasn't complaining about the use (or misuse) of language, as I understand the breadth of ZDooM users. I was really referring to the skimpiness (or occasional lack) of explanation in some instances. And, yes, the absence of examples results in further research being required. Understood about the Wiki. I wasn't really trying to counter your points; I was merely voicing my appreciation for it and the effort put in to get it as good as it is. As editing documents and even general software documentation goes, I'd say it stacks up pretty well against others. As for attenuated lights, the difference between attenuated lights and the earlier types is usually really quite subtle, even on my GTX1080. Generally, attenuated lights look more "realistic" in the way that they interact with scenery and models but it tends not to be an "oh my, that looks so much better" situation and more of just a feeling that the map looks good/better somehow. I have occasionally found situations where I preferred the effect of placing traditional point lights over the attenuated versions though.